John D. Shaw was born in 1961, and was raised in the wild west town of Carson City, Nevada. From as far back as he can remember, he was interested in creating visually exciting artwork. By the early ‘80s, Shaw had moved to central California, where he began his career in Illustration & graphic design. During this time, he created a wide variety of commercial artwork for numerous clients, among them Lucasfilms, Major League Baseball, Kellogg’s, and many others. In 1986, he married a pretty blonde Floridian named Keli, and the Shaws were soon on their way to starting a family. He now found himself creating a vast array of illustration and creative work in the now-booming entertainment software industry. 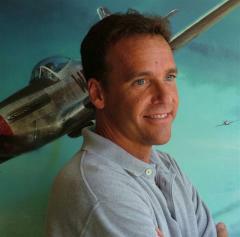 While busily designing of all sorts of fictional characters, backgrounds, vehicles, spaceships, weaponry, military designs, etc, as well as the storyboarding, packaging and marketing art for these products, Shaw began longing to take his work in a more serious and personal direction…highlighting America’s great veterans, with a special interest in World War II Aviation Art. Shaw: “It was around 1992 that this (WWII Aviation) interest, which had been kind of lying dormant for years, just couldn’t be ignored any longer! My Dad had been just a bit too young to see combat in World War II and had joined the Navy shortly before it ended, with the hopes of being a naval aviator. His enthusiasm about the romance and adventure of those days (and those great planes!) had always stuck with me. I had recently seen for the first time the beautiful paintings of artists like William S. Phillips, R.G. Smith, Robert Taylor and a few others, and was absolutely inspired. I feel as if a “Still, Small Voice” was urging me to pursue this type of art myself, not only because of the images, but also for a chance to meet some of the amazing guys who made this history and maybe even help to continue their legacy in some small way. I had little knowledge of the world of Aviation Art, let alone how to market it, but that was okay…at this point it was just a labor of love, and I had no idea where it might lead. Over the years, many of Shaw’s historical aviation and military scenes have become some of the industry’s most sought-after and valuable lithograph titles. They’ve found their way into homes, offices and museums throughout all 50 states and a considerable number of foreign lands (one of the most remote of which is historic Wake Island!) Though most of his scenes are ones that he was personally inspired and motivated to paint, he also occasionally accepts commissioned pieces for individuals or other publishers. Since 2000, the Shaws and their 3 children have resided in North and Central Florida, next to some of the Atlantic’s greatest beaches, where John considers the tropical clouds, ocean, “big weather”, and close proximity to some great aviation history, to be ongoing inspiration for many great scenes to come.